A plastic form of the Modern used with expressionistic monumental scale in the late 60s and early 70s. Concrete is used with full technical competence. 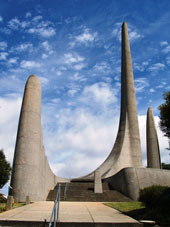 Examples include the 1820 Settler Monument, Grahamstown; Taal Monument, Paarl; and Voortrekker Monument, Winburg.